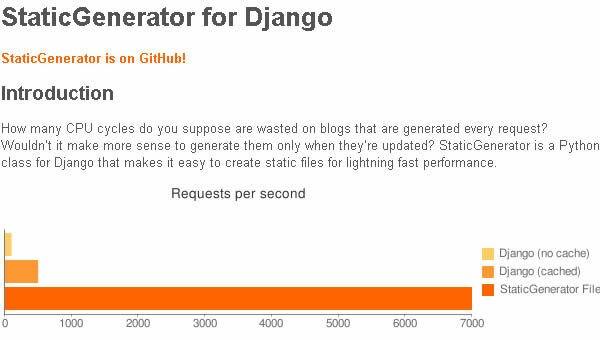 StaticGenerator is an excellent Python class for Django that can help to boost drastically the performance of certain types of web-sites. It works by generating static html files for the chosen pages, this way the server will avoid all the work of generating a page at every request. As you might know, static html pages are much faster to load than any other script processed by the server. I noticed StaticGenerator while I was looking for some cache invalidation solution and I understood that would have been just perfect for my web-site, because the pages of blog and a portfolio don't change that often. The result, as you can see, it's brilliant but it took me some time to make it work properly with Apache because the StaticGenerator instructions show only how to configure it with Nginx. I've found some suggestions around the net that show how to make this trick with mod_python, but unfortunately I use the more recent mod_wsgi, following the suggestion wrote in the Django Documentation. This trick can work also if you use FastCGI, just replace the WSGI with the FastCGI directive and it should work. What are the configuration I need to made to achieve this. I am using apache + mod_wsgi. Please guide me as step by step process so that I can implement it for my site. “You need to install StaticGenerator and configure it properly in your django settings file, then you need to edit your apache configuration file in the virtualhost section to what suggested in this article or similar. I need apache settings for mod_wsgi instead of mod_python. If you want any other information please let me know. “Lots of stuff missing dude. Read carefully the staticgenerator docs. - WEB_ROOT has to coincide with the public directory, usually "public_html" or "www" or "httpdocs" or whatever you configure on your server, but has to coincide with the one that is available to reach from the web. I made the correction what you suggested. Can u tell me please how to check that it is working properly. In brief How to test if staticgenerator is working properly ? “Login as root user into your server and modify one of the html file produced by staticgenerator by writing for example "Test" somewhere in it and save. Reload the page and if you see the word Test correctly where you placed it, it means is working correctly. I solved all my issues regarding configuration, Staticgenerator is creating the folder and index.html in it but it's not serving through this. It is not passing the test as u explain above. “You have to be sure your virtualhost is configured properly. * be sure the last 4 lines explained in this post are set properly and they match each other. Also, are you sure you are really saving the HTML files generated by staticgenerator? When I open one of the file and try to save it I cannot save it unless I open it as ROOT or with the SUDO command. I got the staticgenerator working, its creating folders and caching the index.html files. The site is also functioning properly. But when i edit one file and write 'Test', that is not shown when i refresh my page. Seems it is getting overwritten. “Same as # 14, have to be sure everything is set properly. Also, be sure you are actually saving the html files, because in my case I cannot edit the files created by staticgenerator unless i'm logged as root or using the sudo command via ssh. the files are getting saved, i did recheck them. But when i refresh the page, the edit is no longer there. -ya, i checked the 4 lines. “If the edit is no longer there it means Django re-generates the html files. This happens because apache passes the request to mod_wsgi instead of the static html files. I had put the parent directory of public folder as DocumentRoot in Apache VirtualHost. I changed the DocumentRoot to the public folder. I got static generator working and it is serving from automatic generated folder but after making change in original file ( or in database ) it's not reflecting changes. May be I have to use signal for this. 1. Where should I write signal code ? 2. Which models should I include for dispatching signals ? 3. Should I include all the model that are being used in template ? “I put the signal directives in the model, but I think you can put it even in the urlconf or in the __init__.py of your application if you prefer. The key function to clean the generated html files is "quick_delete". “I had put this signal code in __init__.py but getting no result. I changed a text in my original index.html and expected the change will be reflect on site but still it is serving template from auto generaed (public) folder and no change is displaying. “Hey Karthi, sorry for not answering, I just moved into a new house and I don't yet have the internet line working. So I guess the HTML page is trying to load an address that gives a 404. Instead of using Alias, that might be bypassed by the rewrite rule, link (symbolic link) the static-media folder into the public folder. Create a link called "site-media" in your site's document root that point to "/home/django/mysite/static-media/" and this should do the trick.